Report for week ending August 4, 2017. 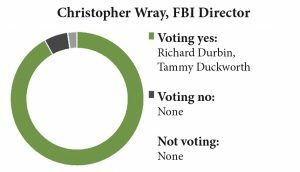 Christopher Wray, FBI Director: Voting 92 for and five against, the Senate on Aug. 1 confirmed Christopher A. Wray, 50, a criminal defense lawyer in private practice, as director of the Federal Bureau of Investigation. He replaces James B. Comey, Jr., who was fired by President Trump on May 9. Wray served as assistant attorney general in charge of the Criminal Division under President George W. Bush. Richard Durbin, D-Ill., said: The next FBI director will be under incredible scrutiny. We need (a) director who will face that pressure with integrity, independence and a firm commitment to the rule of law. He may also have to stand up to this president if the interests of justice call for it. I believe Wray can do that. Charles Grassley, R-Iowa, said Wray was asked very directly what he would do if presented with the opportunity to influence these (Russia) investigations in any way. He (said) he will not condone tampering with investigations and that he would resign rather than be unduly influenced in any manner. No senator spoke against the nominee. 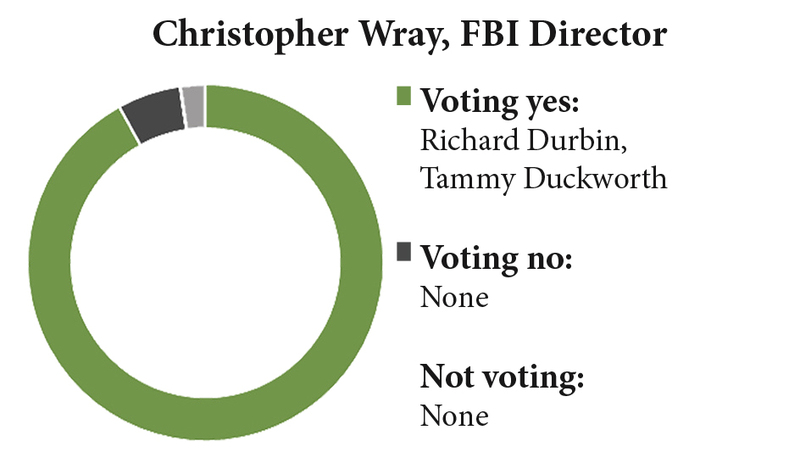 A yes vote was to confirm Wray. 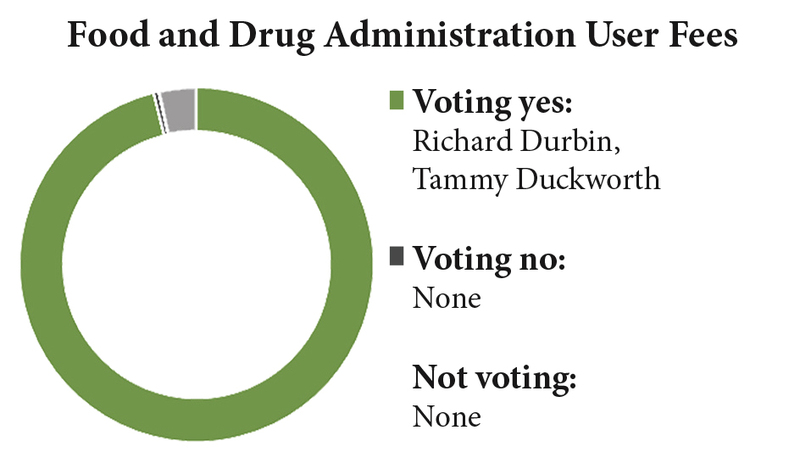 Food and Drug Administration User Fees: Voting 94 for and one against, the Senate on Aug. 3 passed a bill (HR 2430) that would authorize the Food and Drug Administration to collect more than $5 billion over five years in user fees on companies seeking federal approval of brand-name and generic drugs, medical devices and biotechnology products. 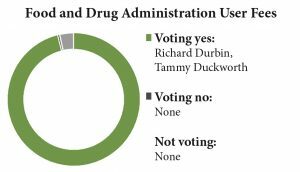 The revenue is expected to fund about 25 percent of the overall FDA budget. 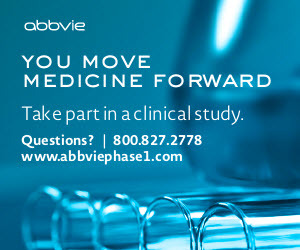 The bill also expands patient access to highly experimental clinical trials; expedites the development of drugs for treating cancer in children; promotes competition in developing generic drugs; speeds the development of over-the-counter hearing aids; cracks down on counterfeit drugs; spurs advances in medical imaging and addresses the rising cost of prescription drugs, among hundreds of other provisions. Susan Collins, R-Maine, said that of the 30 million Americans with hearing problems, only four million can afford hearing aids. By making some types of hearing aids available over the counter just as people buy over-the-counter eyeglasses, this legislation will help increase access to and lower the cost of (hearing) products for the consumers who need them. No senator spoke against the bill. A yes vote was to send the bill to President Trump. Marvin Kaplan, Labor Relations Official: Voting 50 for and 48 against, the Senate on Aug. 2 confirmed Marvin Kaplan, chief counsel at the Occupational Safety and Health Review Commission, for a seat on the National Labor Relations Board. The addition of Kaplan means the five-person panel now has two GOP and two Democratic members, with President Trump expected to put the board under Republican control when he appoints its fifth member. The NLRB is charged with overseeing collective bargaining and resolving workplace disputes between labor and management under terms of the 1935 National Labor Relations Act. Lamar Alexander, R-Tenn., said Kaplan has an admirable record of public service spanning a decade. He could have taken a number of different career paths, but he chose public service, and that should be praised. Brian Schatz, D-Hawaii, said Kaplans lack of experience is dangerous. He will simply be a rubber stamp who brings a political agenda to the board, because he has no on-the-record opinions on these issues of his own. 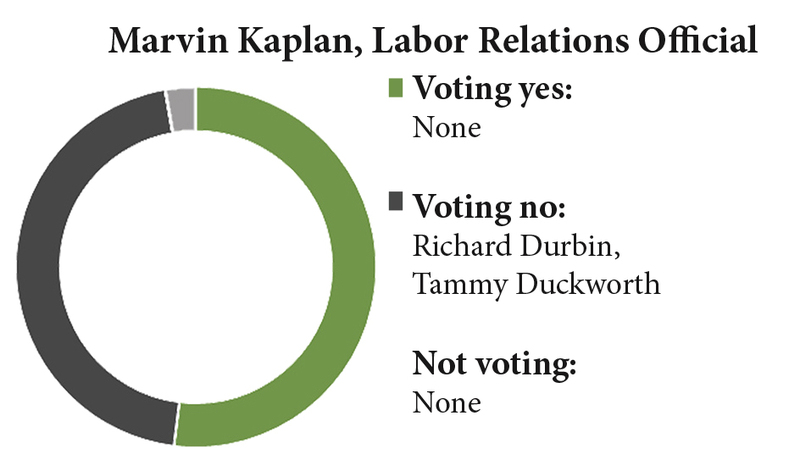 A yes vote was to confirm Kaplan. Dan Brouillette, Deputy Energy Secretary: Voting 79 for and 17 against, the Senate on Aug. 3 confirmed Dan R. Brouillette as deputy secretary of energy, the second-ranking post at the Department of Energy. 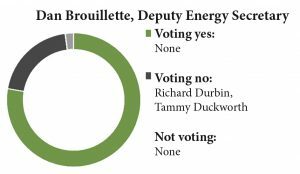 In previous government positions, Brouillette was an assistant secretary of energy, staff director of the House Energy and Commerce committee and state energy regulator in Louisiana. He worked most recently in the financial services industry. Lisa Murkowski, R-Alaska, said Brouillette understands the work that (the department’s) thousands of scientists undertake and the importance of maximizing their research. He recognizes the importance of our 17 national labs and the departments responsibility for environmental management, including the cleanup of Cold War-era legacy (nuclear) sites. 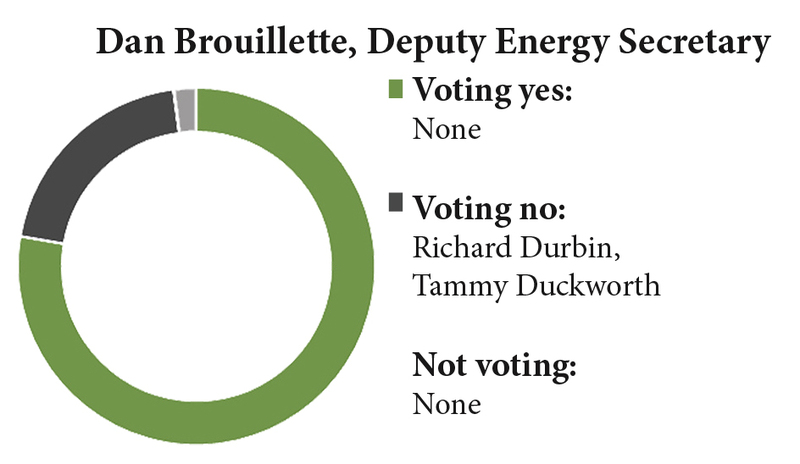 A yes vote was to confirm Brouillette.